Similar to using starred keywords, "tagging" keywords is a simple method for organizing, sorting, and categorizing your keywords. Tags can be applied to keywords when you first add them - in the "Add Keyword Wizard" - or at any time later, via the main Rankings section. Open the Add Keywords Wizard as normal. The final step (step 4) of the wizard lets you apply tags to the newly added keywords. Existing tags are shown. Tick the radio box next to any of them to apply the existing tag to these keywords. To add a brand new tag, just type it in the box, then click the Plus (+) button. Start by ticking the check boxes to the left of the keyword(s) which you would like to work with. Follow these steps to select all or a range of keywords. As soon as you check the first box, the "tag" button will appear at the top of the keywords column. Once finished checking boxes for the keywords to which you'd like to apply tags, click that "Tag" button at the top of the column. A flyout window will appear. Enter the tag that you'd like to apply, then click "Save". There is no limit to the number of tags that any one keyword can have. 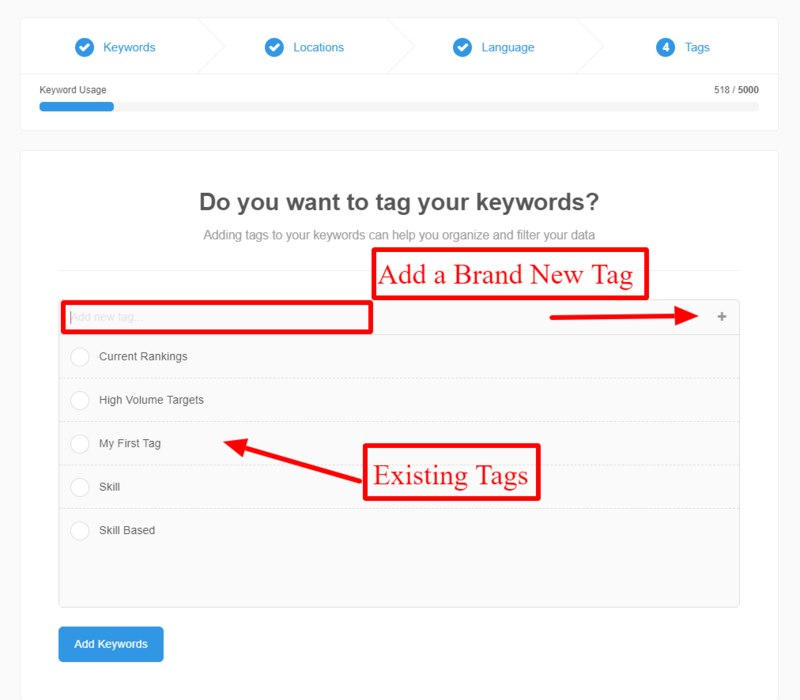 Any given keyword can have as many tags as you choose to apply. Tags must be removed one by one, on a keyword by keyword basis. To remove a tag from a keyword, first enable the "Tags" column from within the "settings slider". Then, click the "X" icon on the tag that you wish to remove.